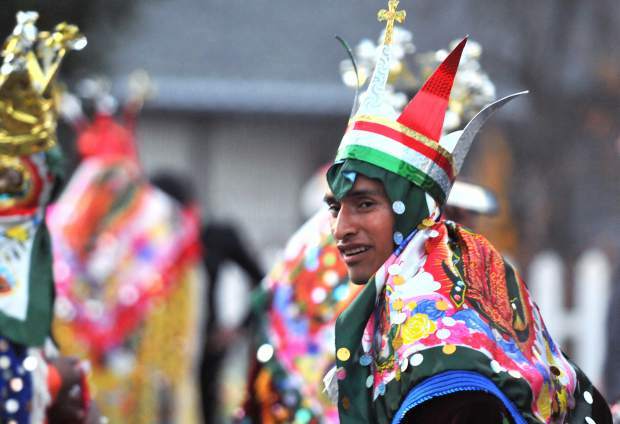 Grass Valley's Cruz Chavez dons colorful attire while preparing for the dance and processional for Our Lady of Guadalupe. 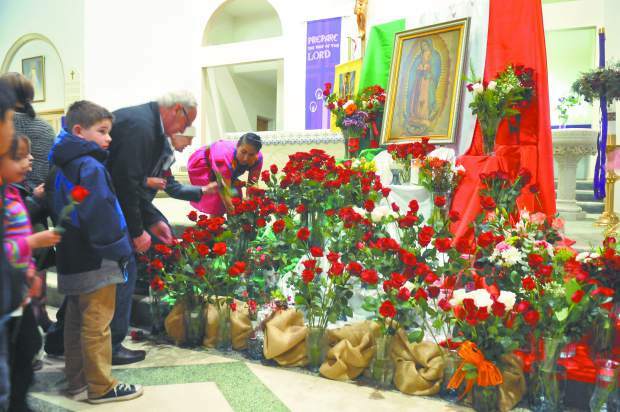 Parishioners approach images of the Virgin Mary with offerings of roses and flowers Tuesday night in St. Patrick's Catholic Church. The roses are symbolic of the flowers that Juan Diego picked at the request of the Virgin Mary as a way to validate the apparitions. Carrying the roses in his tunic, Diego dropped the flowers at the feet of the local bishop, and the image of Our Lady of Guadalupe appeared on the cloth. The tunic exists to this day and is on display in the basilica at Tepayac where 22 million Catholics make pilgrimages to each year. 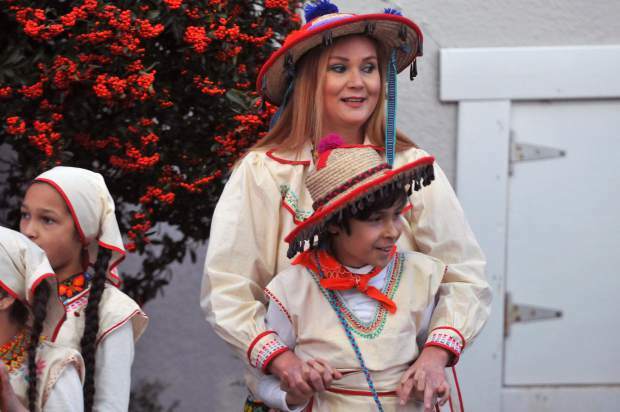 Parishioners dress in festive attire while waiting for the Our Lady of Guadalupe celebration to begin. 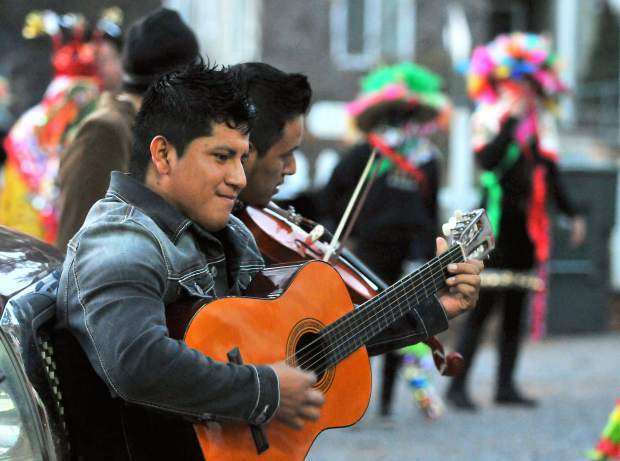 A guitarist and violinist play tunes for the processional to dance to during Tuesday night's Our Lady of Guadalupe processional. Dancers ready to take to the streets in a processional en route to St. Patrick's Catholic Church. 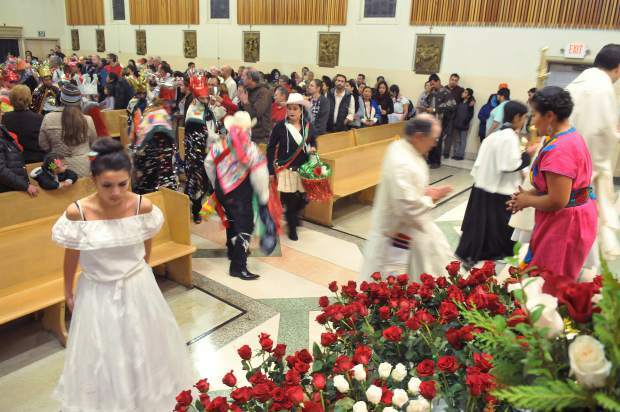 St. Patrick's Catholic Church parishioners approach the altar during Tuesday's Our Lady of Guadalupe celebration. 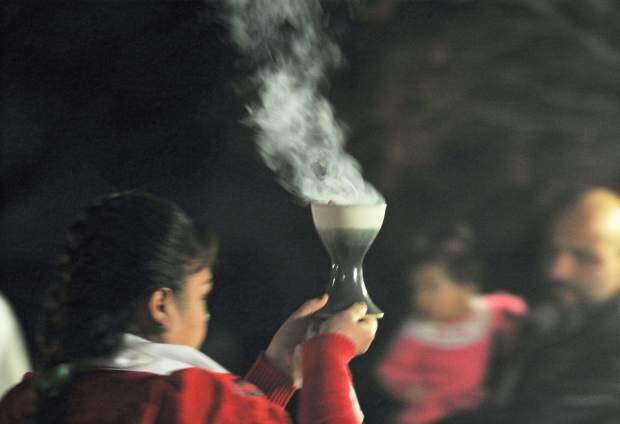 Incense emanates from a chalice used to lead Tuesday's Our Lady of Guadalupe processional. Deacon Richard Soria approaches St. Patrick's Catholic church with a rose offering during the celebration of Our Lady of Guadalupe Tuesday night. 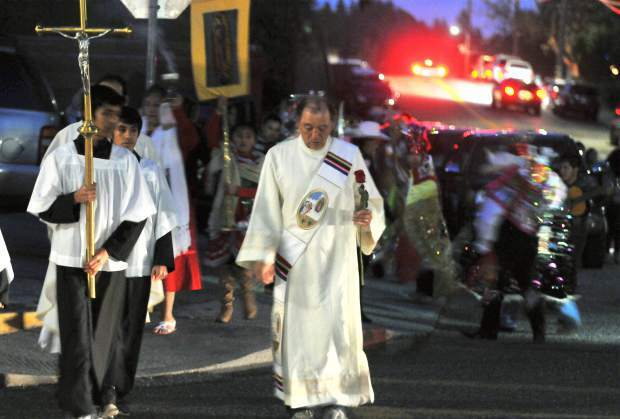 The Our Lady of Guadalupe processional arrives at St. Patrick's Catholic Church. 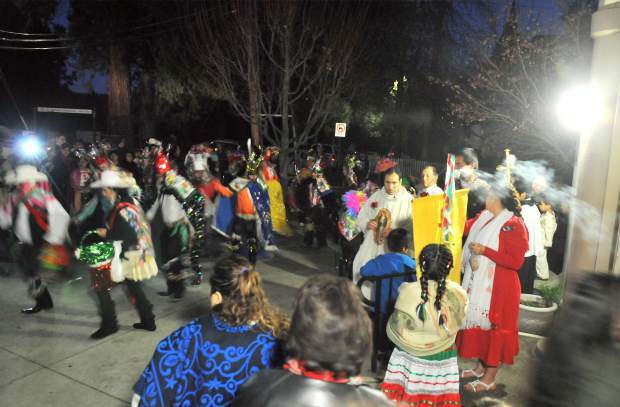 Grass Valley’s vibrant Mexican-American community came together Tuesday night to honor Our Lady of Guadalupe with music, song, dance, and a street processional that culminated inside St. Patrick’s Catholic Church with a mass dedicated to the Virgin Mary. 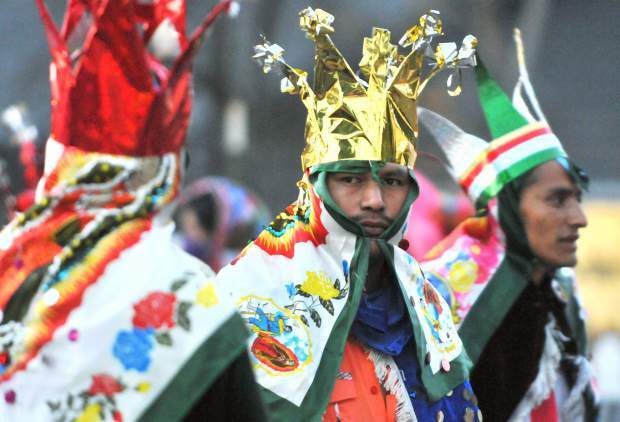 The celebration honors the Virgin Mary’s appearance to Juan Diego Cuauhtlatoatzin atop the hill at Tepeyac Mexico in December of 1531. The Virgin Mary’s appearance to Diego, a Native American, was an important event that helped to bring the Spanish, indigenous, and mestizos together under one God and religion. Many communities across the Spanish-speaking Americas celebrate the apparition and subsequent miracles by holding pilgrimages to the site in Mexico where the Virgin Mary appeared, as well as holding feasts and celebrations in their own communities on Dec. 12. 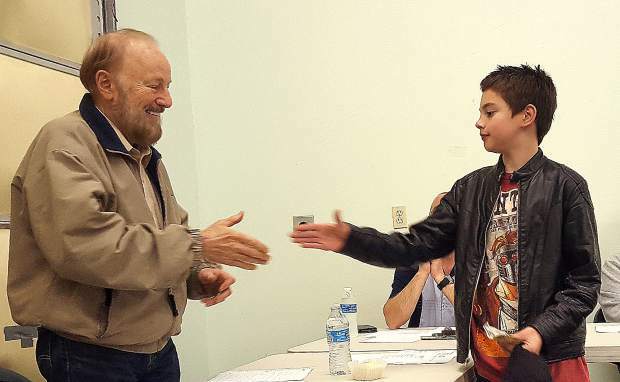 Contact Multimedia Reporter Elias Funez at efunez@theunion.com or 530-477-4230.